Blah. This guy seems to suffer from jigsaw syndrome. 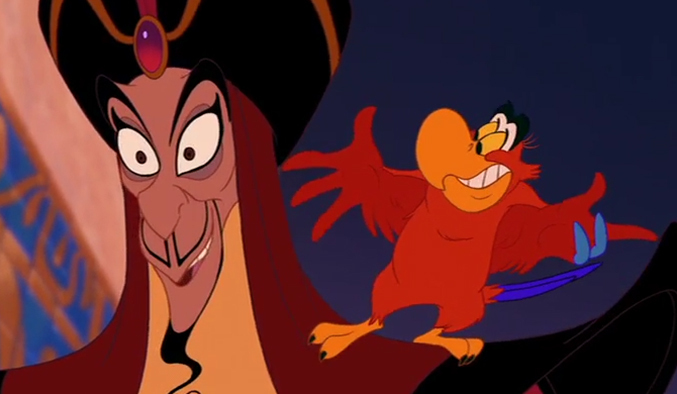 A loudmouth parrot, ambiguous magic, and a ponce-y attitude? 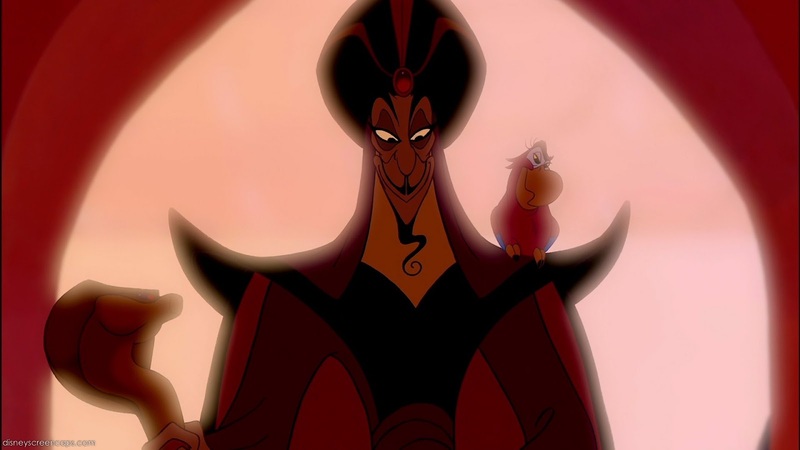 I feel like the writers took pieces of standard villains and threw them into Jafar because they'd worked for others. The result is something clownish and doesn't fit in an Arabian setting. Which is fine because the real focus of the movie is Aladdin and the Genie. Motivation: Very generic motivation -- power. No reason is given for why he wants it, or what would happen if he doesn't get it. Nothing to lose, nothing to strive for. Where does his power come from? How did he know about the lamp in the first place? 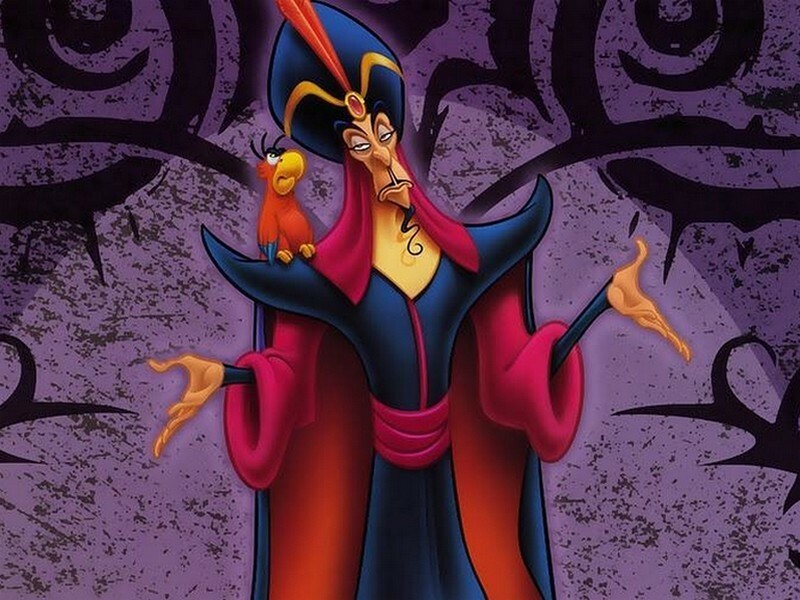 How'd he get the job of vizier? A little history would be nice people. Character Strengths: Very little. 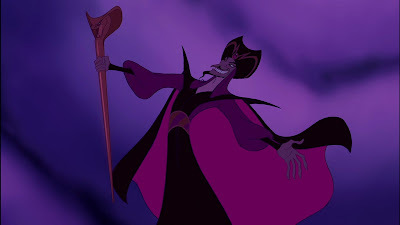 Like other villains, he's all about schemes and lies. None of them are terribly creative or effective. (Really? You had the power to hypnotize the sultan to do whatever you want and only NOW you think of marrying his super-hot Kim Kardashian daughter?) And you know as soon as he gets in power he's going to Scar it up and ruin the country. Evilness: He seems to thrive on humiliating others below him (and some above). That points to some psychological issues, but nothing particularly explored. And the grabs for power mean that he thinks little of those who stand in his way. 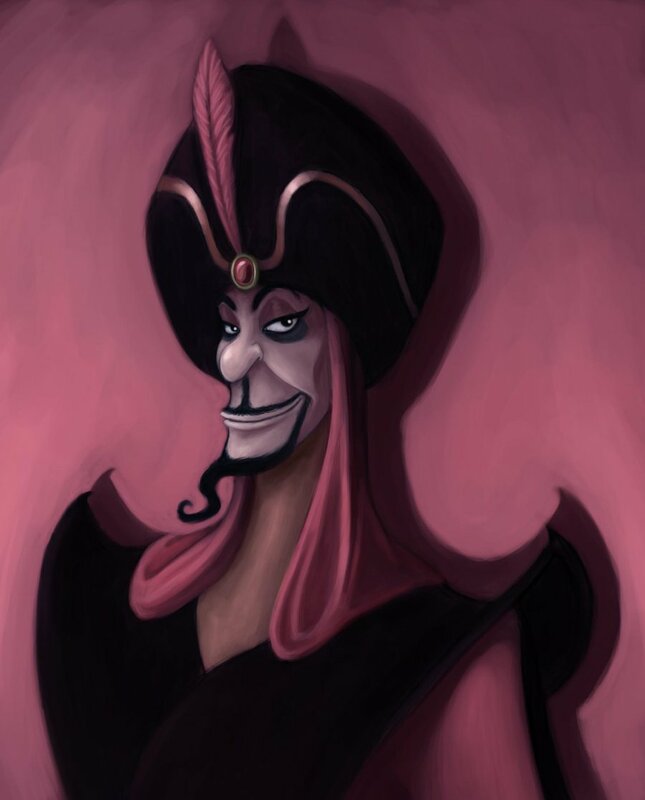 All Jafar wants is the lamp. He'll do anything to get it, but avoids dirtying his hands. 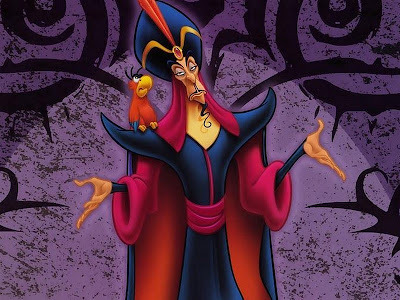 Like the other foppish Disney villains, he makes underlings do his dirty work, and that inevitably leads to setbacks that could be easily remedied. Tools: He's got enough expertise in magic (from the generic book of mystical, middle east voodoo) to do a few decent spells. Hypnotization, locator spells, glamors. It's all tied to his staff, so once he loses that, he's out of power. (The wikipedia says he's an alchemist, not a sorcerer, but we all know what's up). Iago doesn't do much but provide comic relief. 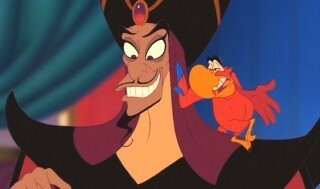 In fact, he turncoats in Aladdin II. He also seems to have the kingsguard under his thumb, because without batting an eye, they kidnap Prince Ali and throw him in the water. Apparently, they're not concerned about possibly creating an international incident or war between their kingdoms. Fatal Flaw: Not understanding where power comes from. 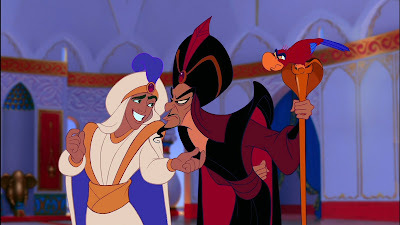 Aladdin tricks Jafar into reconsidering his chain of power. It's sort of a "The Fisherman and his Wife" scenario. He keeps asking and asking, and finally asks for too much. Method of Defeat/Death: Aladdin thinks of a way to hoist Jafar by his own petard, informing him that he'll never be as powerful as the Genie, since the Genie is the bestower of his current power. What's the solution? Wish to be a Genie. Unfortunately a lack of attention to the fine print means that he is cemented into a lamp for the rest of his days, obliged to serve whoever rubs him down. 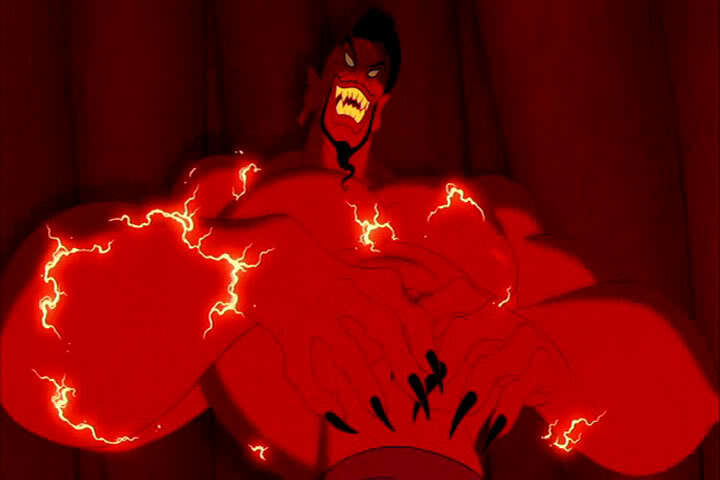 And since Genie hurls his lamp into the nearly inaccessible Cave of Wonders, it's safe to say he won't be doing too much with his new found power. 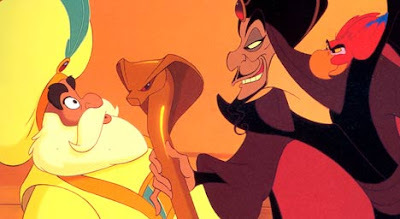 Which is too bad, because I would have liked to see him roll as a genie.